﻿Choose and place plants with care to decrease your danger from wildfires. Sept. 4, 2011, started like any other Sunday morning with people hustling about their business, shopping and going to church. Nothing seemed out of place. Around 2:30 that afternoon I left the house, noticing that the air had a slight smoky smell, but nothing seemed unusual until I got to the main highway. Traffic was heavy for a Sunday afternoon, almost all headed out of Bastrop. When I finally turned onto the highway headed for town, I noticed a huge plume of smoke to my left. Wildfire! Before the week was over, more than 1,600 homes would be lost in what was Texas’ worst fire loss in history. The fire blew up suddenly, and the strong winds, coupled with hot, dry air and abundant fuel, caused it to spread very fast. The pine woods and post oak savannah around Bastrop were thick with brush, and the dry weather made it ready to burn. The Bastrop fire was just one of many in Texas in recent years; that same weekend there were fires all across the state. There is nothing unusual about fire — it’s a natural component of our Texas landscape. What was unusual was how quickly these fires spread and how much fuel was available. Cactus is a good plant to have next to your home. 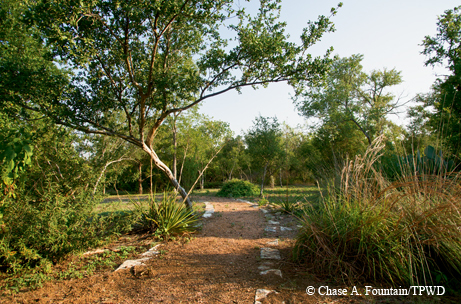 As the multiyear drought continues, Texas remains a tinderbox, so we should examine our landscape practices to help preserve our properties and prevent another disaster like Bastrop’s. Careful selection of plants, discriminate placement of plants around our homes and businesses and attention to inherent characteristics that cause one plant to be highly flammable while another is much less volatile will reduce the risk considerably. Conscious efforts to reduce the fuel loads around our communities will also help protect us. While the Bastrop fire was primarily rural, there were elements of an “urban wildland interface” — where city lots are interspersed with greenbelts and rural lots — involved in this blaze. Different situations affect the risk our properties face, and thus influence the plants we can safely use in landscaping for wildlife. Urban landscapers, because there is little risk of fire approaching from off the property, can essentially choose to use any plant at any location. In an urban wildland interface, the risk of fire increases, and we must choose plants more carefully. In a rural area, where the volunteer fire department may be a long distance away and the fuel load around the property can be heavy, selecting plants carefully and placing them wisely can make the difference between a home that survives a wildfire and a burned-over foundation. While Texas offers a wealth of plants to use in landscaping, characteristics of some of these plants make them unwelcome risks close to our homes. Watching a fire cross the prairie, you can see that it stays close to the ground until it hits certain brush or tree species, then it explodes skyward, accelerating quickly and aggressively. These plants, if planted close to your home, enhance the risk of fire damage instead of reducing it. The surprising thing is that some of these plants — like yaupon, juniper, rosemary and others — often border foundations and decorate the outside of homes. While providing landscape features that are very valuable to wildlife, they should not be used close to our homes. Features that make a plant volatile include the presence of an oily resin, a tight canopy that traps air and a tendency to dry quickly in xeric conditions. The Texas Forest Service is developing a table that includes the flammability of various Texas landscape plants, but until this project is completed, we must rely on observations of how fire reacts with certain plants. In addition to the three species noted above, plants to avoid using near the house include holly species, wax myrtle, red cedar and similar plants. Close to our homes we want plants that will remain green, even when dry, and will resist burning. Many native wildflowers show these characteristics, as well as some brush species and several trees. 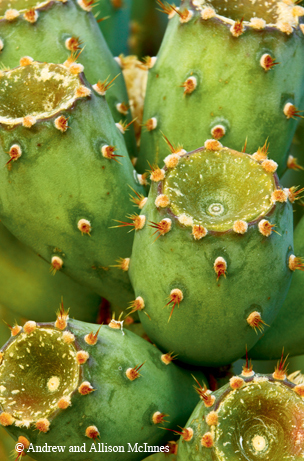 Having a safe, fire-resistant landscape does not mean settling for cacti and granite. We can still enjoy colorful landscapes that will serve the needs of wildlife in our gardens, but we need to use carefully selected plants to ensure our safety. ﻿Clearing out underbrush and installing walkways and other “hardscape” will make your home less vulnerable to fire. The basis for a firewise landscape is reducing the risk of flammability the closer you get to the structure you want to save. For example, a cedar tree 200 feet from the house is not nearly as great a risk as a cedar tree 20 feet from the house. By using plants that present a low fire risk close to your home, and increasing the risk as you move away from your home, you begin to develop a “defensible space” around your home. Firewise planning breaks the space around your home into three distinct zones. The first zone, from immediately against your walls out to about 30 feet, should be a very low-risk area. It needs to be kept somewhat open to facilitate firefighter movement around the home, should this become necessary. This is an area where color can be introduced with wildflowers, succulents and cacti. You want to use plants that are difficult to ignite and burn. Some structure is certainly possible in this area, but structure should not be introduced at the expense of safety. Another consideration in the first zone is avoiding “fire ladders” in the area close to your home. A fire ladder is a plant that, because of its growth habits and flammability, will take fire from the ground level and transport it quickly to your roof. These plants usually have thin, dry branches and leaves close to the ground that continue to the top of the plant. 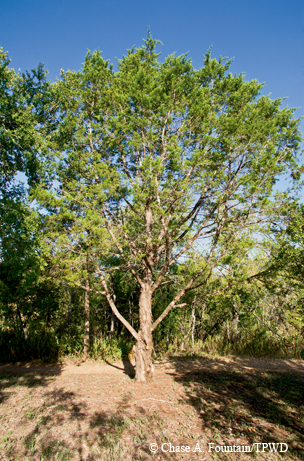 Cedar is a good example (and one that is often used near the foundations of homes), but several other plants match this description. If these plants are used in the landscape, they should be well back from the home, or the limbs should be trimmed to eight or more feet from ground level. A final concern close to your home is the material lying on the ground. Pine needles, dead leaves and even mulch can become a fire hazard when dry. Cleaning up needles and leaves, cleaning out the gutters around the edge of your roof and keeping the mulch moist around your plants can go a long way to reducing your fire risk. Driveways, walkways, rock walls and other “hardscape” can be valuable tools in slowing the advance of wildfire around your home. While the Bastrop fire was hot and moved fast enough to jump four-lane divided highways, this is not the usual situation in prairie, grassland or forest fires. Asphalt, concrete or other paving materials, like those used for driveways or walkways, can slow the advance of fire enough to provide time to water the landscape and possibly save the building. When planning your landscaping, place driveways, walkways, rock walls and other mineral-based features in places where they can intercept the most likely path of fire onto your property. For larger properties, select effective fire-break locations for access roads. Similarly, water features — especially streams and fountains — can be used to slow fire progress. The second zone, beginning 30 feet from the house and extending out to 60 feet, can contain slightly more flammable plants, but you should still avoid plants that are highly volatile. This is an appropriate area to introduce moderately flammable brush species like viburnum and partridgeberry, and native bunch grasses, but only if they can be kept relatively green. Dry grass can be very volatile. Since you are introducing plants from all layers of a typical plant community, you can begin developing a structural pattern that will allow wildlife to thrive on your property. Some ground cover of leaves and needles can be left in the second zone in times when the weather is moist enough to reduce fire risk. In periods of drought, it is still a good idea to reduce the fuel load by cleaning up these materials. While this is a favorite area for thrashers, ovenbirds, roadrunners and other birds to forage (as well as a great place for insects, toads and other reptiles to hide), maintaining this layer must not be allowed to enhance your fire risk. Cedar trees and other highly flammable species should be kept 60 feet or more from your home. The third zone is far enough from the house to introduce almost any native plant you wish, while still maintaining the idea of keeping the more flammable plants distant from your home. It would still be wise to place highly flammable plants only at the edge of your property. When left unattended, landscapes quickly become overrun with brush and other weedy species. In small landscapes — the typical suburban lot — manual removal by pulling or cutting the plant is often the easiest, most cost-effective way to keep encroaching plants out of your landscape. For larger properties — those often found in rural or urban wildland interface regions — pulling the brush mechanically with a root plow or chaining device may work. By far, the most cost-effective means of controlling brush in larger landscapes is fire. A controlled burn, prescribed to reduce fuel loads and reduce brush, will effectively decrease the threat in and around the area burned. Prescribed fire can also work to protect communities and subdivisions when it is used to reduce the fuel load in the wildlands surrounding the neighborhoods. Texas is a large state that, in many areas, has become a tinderbox of heavy fuel waiting for a spark to ignite it. By taking a proactive approach in our landscapes and selecting plants with their potential flammability in mind, we can reduce the potential immediately around our homes and help protect the property we value so much.